The National Police Commission (NAPOLCOM) opened the online application system (OLEASS) for October 25, 2015 PNP Entrance and now available today, August 3, 2015 (Monday) at 12 noon. Online Application Scheduling for Promotional Exam will be activated on August 10 (Police Officer) and August 17, 2015 (Senior Police Officer, Inspector and Superintendent). "The ON-LINE EXAMINATION APPLICATION SCHEDULING SYSTEM for the PNP Entrance Examination will be activated on August 3-7, 2015. The on-line registration form can be accessed at 12:00 noon on August 3, 2015 onwards. To use the system, go to www.napolcom-oleass.com," the Philippine National Police announced on Facebook. When applying to take a NAPOLCOM examination, you have to do is provide the required personal information online (OLEASS), click on the SUBMIT button and your official confirmation stating your appointment date will be displayed on the screen. DO NOT APPLY IF YOU'RE NOT QUALIFIED. Note that testing location wherein a qualified applicant will take the examination is automatically assigned by the computer system based on the region where the permanent address/unit assignment is located. 1. 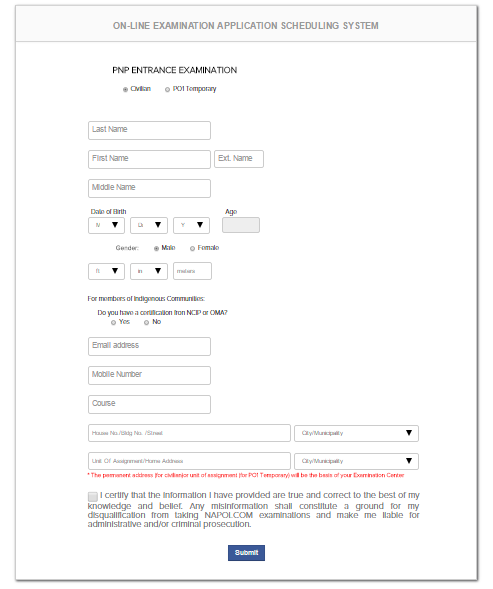 Accomplish the one-page application form by filling out all of the blank fields in the application form. Fields marked with a red color are required. Submission will not be successful until all required fields are properly accomplished. 2. When the encoding is completed, click the SUBMIT button. A notification message will appear on screen confirming that you have successfully submitted your application. You can immediately print the confirmation letter displayed on the screen. 3. Proceed to the NAPOLCOM Regional Office or to the office indicated on the confirmation letter and present all the documentary requirements for assessment, payment of prescribed fees and issuance of Notice of Admission (NOA). 4. For applicants who failed to print their confirmation letter, a QUERY/VIEW facility is available here.